ANY OF US WOULD KILL A COW RATHER THAN NOT EAT BEEF. How right the man was. I have had a very gentle non boozy weekend after the over indulgences of The Great British Beer Festival ( strange how each year it takes me longer to recover from that day) and even now, on Sunday, the thought of booze still promotes a shudderous warning from my liver. However, after a a 16 miler this morning as I move ever closer to the NYC martathon, I was feeling more human and certainly hungry enough to consider some more beef. It had, after all, been over three days since that steak in Hawksmoor. An eon in beef eater terms. 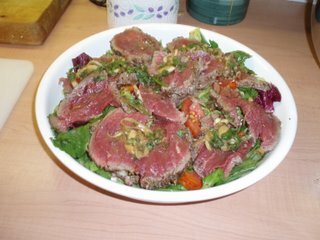 HP had suggested a Thai style beef salad which struck me as an excellent idea for a warm Sunday. So, yesterday, an early morning wander down to Borough Market saw me buy a stupendous piece of fillet from Northfield Farm and all the other bits and bobs for a late lunch. As so often with dishes outside my regular experience, I have no idea how authentic it was or otherwise, but it certainly tasted the part. A dressing of chillies,spring onions, garlic, lime juice and zest, fish sauce, soy sauce and lemon grass with lots of corriander leaf made the perfect foil to the beef which is just rolled in crushed sichuan pepper before being seared on a very high heat so the outside takes on colour but the inside remains raw. Not much else to say other than it is well worth trying as a very agreeable light lunch or supper. Now there's a man with a colon of iron. Good work!